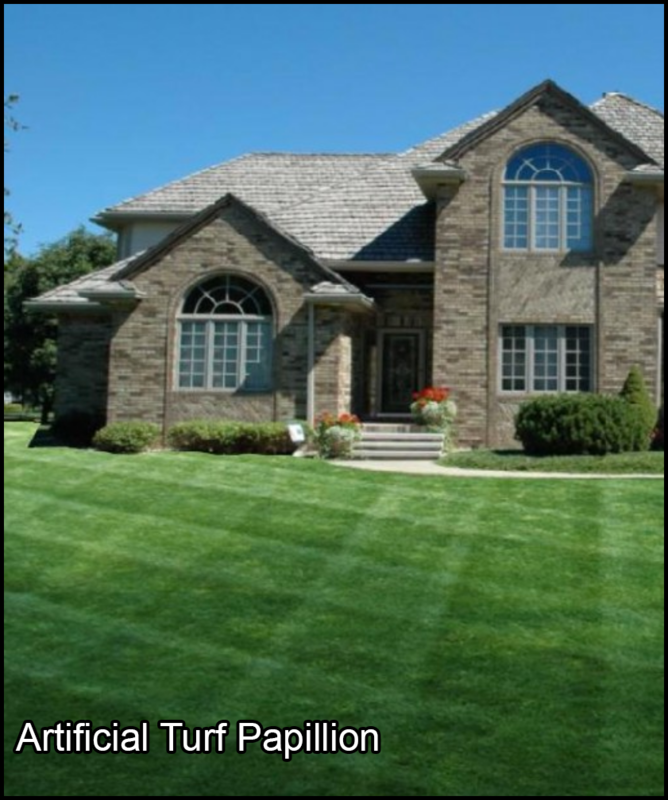 Artificial turf in Papillion is how to get a beautiful lawn with no fertilizing, planting, or gardening involved. Papillion homeowners who want a vibrant, green yard but do not have a green thumb can still do by installing artificial turf in Papillion. Heroes Lawn and Landscape offers top-notch landscaping solutions including artificial turf to Papillion residents who wish to create a breathtaking garden. Without having to invest time and effort in gardening, you can opt for the easier and eco-friendly option—calling us to set up artificial turf in Papillion. Still not convinced? Read on to learn more about the benefits of having artificial turf in Papillion. Color: When it comes to the color of artificial turf, Papillion homeowners shouldn’t blindly pick the greenest-looking turf. Luckily, our artificial turf has a beautiful lush green color that doesn’t look plastic or fake. Low-Maintenance: It shouldn’t be hard to clean artificial turf. Papillion homeowners can breathe a sigh of relief knowing that our turf is very easy to clean. You can simply let rainwater wash off the dirt on your turf. Additionally, blemishes and soiled spots can easily be removed with detergent and warm water. Texture: When buying artificial turf, Papillion residents should go with products that are non-abrasive. Coarse artificial turf is sure to irritate skin when kids are at play. Luckily, our turf is pet-friendly, non-abrasive, and play friendly. You can play all day without having to worry about rashes, allergies, and other skin irritations. It takes anywhere from 5 to 30 days for grass seeds to germinate. Afterward, it will need constant maintenance just to achieve a beautiful color. On the other hand, artificial turf in Papillion instantly beautifies your lawn. With artificial turf, Papillion, residents don’t have to waste time on gardening. Simply set up your artificial turf and that’s it. You can even host a party in your backyard the evening after you installed your artificial turf. Papillion homeowners who want to have a lawn that’s instantly beautiful should definitely consider getting artificial turf in Papillion. If you think that artificial turf in Papillion is harmful to your pets and the environment, then you couldn’t be further from the truth. When it comes to pet-friendly artificial turf, Papillion residents can depend on Heroes Lawn and Landscape for play friendly turf. Have you ever stopped to think how much water and electricity is used when maintaining natural grass? You’ll need a considerable amount of water to maintain a 10×10 lawn. On the other hand, you can simply let rainwater wash away the dust and pollen on your artificial turf in Papillion. Artificial turf in Papillion is the perfect landscaping solution for people who want a beautiful yard in the shortest time possible. After installing artificial turf in Papillion, you and your family can play, stargaze, camp, sports, and more—all in the comfort of your own yard! Get Artificial Turf in Papillion, Nebraska Today! When it comes to high-quality artificial turf, Papillion residents should turn to Heroes Lawn and Landscape. We are professional contractors who provide an array of services ranging from routine lawn maintenance to constructing beautiful outdoor living areas. Visit our website for more information! Keeping your garden, grass, plants, and trees beautiful and healthy requires regular lawn maintenance and fertilization. However, looking after your lawn can be difficult when you have other responsibilities, such as work and family. Do you want a new look for your outdoor spaces? Turn to the experts at Heroes Lawn and Landscape for expert landscape design and maintenance services. Our team has the skills, experience, and equipment to implement a full-scale landscape design project for residential and commercial clients. We meet with our clients first so we can fully understand their goals. Also, we provide regular updates throughout the course of the project to ensure that our clients and our team are on the same page. Our experts use products that are strong enough to eliminate ice without damaging concrete or vegetation. What’s more, during the winter season, we are on call 24 hours a day, seven days a week. At Heroes Lawn and Landscape, we pride ourselves on our ability to provide our clients with the services they need to keep their lawns and yards attractive, functional, and safe. Our experts follow exceptional workmanship, dedication to customer satisfaction, and innovative approach to landscaping are just some of the many things that set us apart from the competition. Learn more about how we can transform your outdoor spaces into showcases by giving us a call today! You may also request a quote by filling out our online form. We look forward to helping you achieve the lawn or yard of your dreams. Call us today!